The passengers of Flight 1549 were soaked and freezing, but they were also alive. 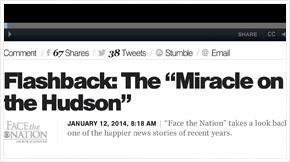 “We had a miracle on 34th Street. 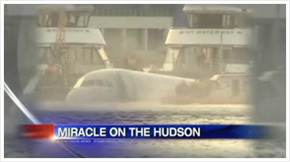 I believe now we have had a miracle on the Hudson,” Gov. David Paterson said. US Airways Flight 1549 took off at 3:26 p.m. It was less than a minute later when the pilot reported a “double bird strike” and said he needed to return to LaGuardia, said Doug Church, a spokesman for the National Air Traffic Controllers Association. He said the controller told the pilot to divert to an airport in nearby Teterboro, N.J. It was not clear why the pilot did not land at Teterboro. Church said there was no mayday call from the plane’s transponder. The plane splashed into the water off roughly 48th Street in midtown Manhattan – one of the busiest and most closely watched stretches of the river. US Airways CEO Doug Parker confirmed that 150 passengers, three flight attendants and two pilots were on board the jetliner. The pilot, identified as Chesley Burnett Sullenberger III, is credited with saving all of the passengers. Kolodjay, 31, who had been headed to a golfing trip in Myrtle Beach, N.C., said he noticed a jolt and felt the plane drop. He looked out the left side of the jet and could see one of the engines on fire. “Then the captain said, ‘Brace for impact because we’re going down,”‘ Kolodjay said. “It was intense.” He said some passengers started praying. He said a few Hail Marys. “It was bad, man,” Kolodjay said. But he and others spoke of a sense of calm and purpose that quickly descended on the passengers and crew as the plane started filling with water and rescue boats swarmed to the scene. They decided women and children would be evacuated first. Sullenberger, 58, described himself in an online professional profile as a 29-year employee of US Airways. He started his own consulting business, Safety Reliability Methods Inc., two years ago. Bank of America and Wells Fargo said they had employees on the plane. Charlotte is a major banking center. Air Traffic Control reports the plane after takeoff reached 3,000 feet before heading towards the river. The plane had reached a speed of 178 mph.